Sodexo Iberia, the world leader in Quality Life Services and France’s number one private employer in the world, and Telefónica Business Solutions, leading provider of a wide range of digital services and integrated communications solutions for the B2B market, have agreed to widen the scope of their collaboration with the provision of new digital services. The new scope of work will help Sodexo to enhance its value proposition embedding innovative digital screens into its services. First results of this new collaboration are being showcased at the global headquarters of Telefónica in Madrid, at a new Sodexo Iberia designed and managed onsite restaurant where more than 12,000 Telefónica employees are already enjoying a full new digital and sustainable restaurant experience. Leveraging Telefónica On The Spot Services, Telefónica’s IoT unit specialized in digital signage and digital transformation of physical environments, Sodexo has reimagined the employee restaurant experience redesigning the entire premises and creating a new dynamic and more efficient space by integrating the latest digital services and offering a personalised experience to each customer. Telefónica On the Spot Services working with Sodexo have created an immersive experience through the use of multiple digital screens showing news, nutritional information, offers and dynamic content. 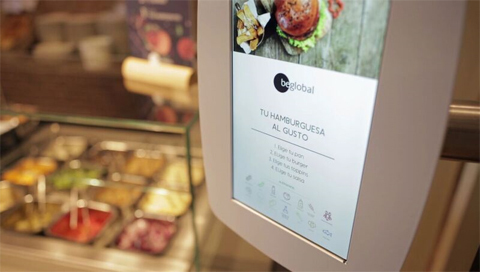 The automatically updated content on the screens has been made possible by integrating Telefónica’s smart retail platform with Smart, Sodexo’s food management platform, allowing a more efficient, agile and better service to customers. Telefónica Business Solutions, a leading provider of a wide range of integrated communication solutions for the B2B market, manages globally the Enterprise (Large Enterprise and SME), MNC (Multinational Corporations), Wholesale (fixed and mobile carriers, ISPs and content providers) and Roaming businesses within the Telefónica Group. Business Solutions develops an integrated, innovative and competitive portfolio for the B2B segment including digital solutions (Cloud or Security) and telecommunication services (international voice, IP, bandwidth capacity, satellite services, mobility, integrated fixed, mobile, IT services and global solutions). Telefónica Business Solutions is a multicultural organization, working in over 40 countries and with service reach in over 170 countries. In June 2015, Telefónica Business Solutions and Bouygues Telecom Enteprises strengthened their alliance on the French market, with the creation of “Telefónica Business Solutions France, A Telefónica & Bouygues Telecom company”, a joint venture that offers services dedicated to multinationals.